LOCATION.--Lat 42°08'32", long 74°15'54" referenced to North American Datum of 1983, Greene County, NY, Hydrologic Unit 02020006, on left bank downstream from bridge on Diamond Notch Road, about 1.0 mi upstream from mouth, and about 1.0 mi north of Lanesville. PERIOD OF RECORD.--Occasional miscellaneous discharge measurements, water years 1985-86, 1988-94. October 1997 to current year. GAGE.--Water-stage recorder and crest-stage gage. 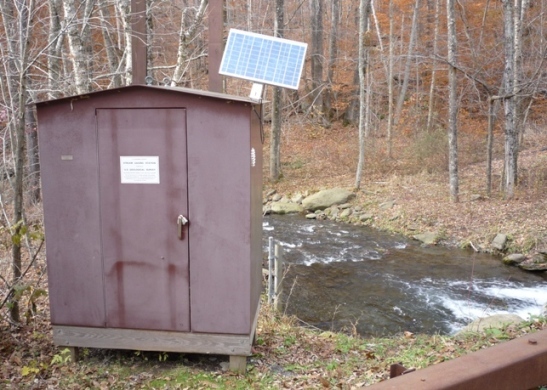 Datum of gage is 1,477.03 ft above NGVD of 1929 and 1,476.44 ft above NAVD of 1988 (VERTCON). EXTREMES FOR PERIOD OF RECORD.--Maximum discharge, 487 ft³/s, Aug. 28, 2011, gage height, 5.89 ft, from rating curve extended above 230 ft³/s on basis of step-backwater analysis; minimum, no flow Sept. 18, 19, 2001, as a result of temporary drainage of gage pool by local fire department; minimum gage height, 0.55 ft, Sept. 18, 2001.